IT WAS one of the dark moments of the season. Pompey were presented with a physical challenge as they went to Barnet chasing promotion. And it was a test they failed as Martin Allen’s side battered their way to a 1-0 victory at The Hive. The enduring image of that night will be Blues captain Michael Doyle becoming embroiled in a flashpoint with angry supporters, as he apologised following the loss. Kyle Bennett was part of Paul Cook’s starting XI that cold February evening in north London, as John Akinde’s first-half penalty made the difference. But Bennett believes it will be a different Pompey side making the trip to take on newly-appointed manager Kevin Nugent’s side. The Blues have picked up 13 league clean sheets this term, which illustrates a stronger backbone to the winger. And the late rearguard action against Blackpool on Tuesday night is further evidence to Bennett that Pompey are playing with resolve. The 26-year-old knows they are qualities which will be needed this weekend. Bennett said: ‘It was a tough game last season. ‘But this season I feel we’ve cut out some of those errors we were making before. ‘Maybe we were a bit soft-centred. You can see from the last 15 minutes against Blackpool that’s not the case now. Akinde’s goal made the difference last season when the two sides met at The Hive. He stepped up coolly convert his spot-kick – one of 24 goals he bagged last term. That followed on from a campaign where he smashed home 32 efforts for Barnet. And the 27-year-old already has 20 finishes to his name this season, as he underlines his place as one of the hottest goal-getters in English football. In fact, no-one in the top four divisions of English football scored more goals last year than the former Pompey striker. It was a tough time at Fratton Park for Akinde, however, as he failed to get on the scoresheet in 11 appearances in 2013. 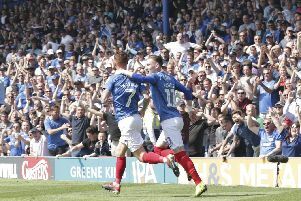 Bennett knows the physical danger the league’s top scorer presents – but believes Pompey are equipped to take on that battle. The Blues go to Barnet buoyed by back-to-back league wins to make the league look better viewing. Bennett insisted the focus is firmly on what lies ahead now, though. He said: ‘You have to have a look at each game. It’s tightening up. ‘The dressing was rocking Tuesday, but you don’t want to get carried away. ‘It’s on to the next one. The three points from Blackpool have gone and it’s about Barnet. That’s what we have to look forward to now. ‘Every team brings a different challenge. We’ll go back to the drawing board and look at the test they offer.